You have read all the advice on moving with pets, and you have plans in place to make the transition as easy as possible for your dog and/or cat. We will call them Butch and Fluffy (Butch is the dog). The big moving day has arrived and Butch and/or Fluffy are freaking out. And since our pets are more important than life itself, we can’t have them going bonkers, can we? So, here are some good ideas for making your pet (and you) feel at home after a move. First, make sure your new place has been thoroughly cleaned, especially if it belonged to another pet. Your animal DOES NOT want to smell anybody else in the new place. If this is impractical, put down puppy pads for both cats and dogs. Your house will look awful, but since you have not yet unpacked, it probably does anyway. Prior to your move, do not wash animal beds or blankets. The funkier they smell, the better, in your pet’s opinion. By the way, moving the animal stuff is a great moving day task for kids. For cats, it is a good idea to keep Fluffy in for a few days, and expect lots of hiding. Make sure you know all of the new house’s nooks and crannies and make sure they are safe for your pet to hide in – you do not want Fluffy getting stuck inside a wall or escaping from a crawl space. Make a nice bed (with water and maybe even a litterbox) inside one of the closets. If Fluffy wants to stay in there for several days, let her. If you have a multiple cat household, you may need to temporarily give up more than one closet. Hey, you are too tired to unpack anyway, right? Who and what is more important, Fluffy or your shoe collection? It goes without saying that you will need to use the same food and water bowls for Butch and Fluffy. Put food and water down as soon as you get into the new place. Do not worry if they do not eat for a day but make sure they stay hydrated. Put them in about the same place that they were in your old place – kitchen to kitchen, laundry to laundry, etc. Take the sheets off the bed in the old house and then put the very same sheets back on the bed in the new house. Bring your pet to bed with you. 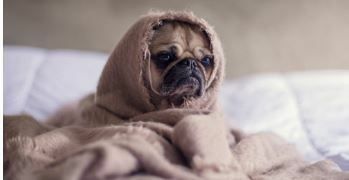 Nothing will be as comforting for your pet as being safe and warm with their human and being surrounded by familiar smells.Keep the same routine – same daily activities at the same time, same leisure activities, at the same time – and soon Fluffy and Butch will have their comfortable routines set, too. And they will be as happy in their new home as you are.